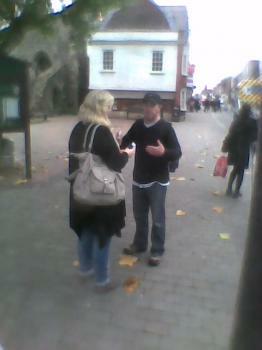 Saturday, November 5th, Rob Hughes and I both hit Brentwood town centre. 'Armed' with loads of tracts and a willingness to preach the Gospel to the lost, we were soon joined by Elyske and Ingrid to make a team of four. 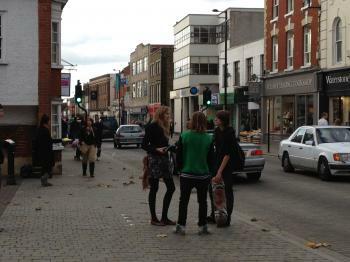 The High St was consistently busy today which made handing out tracts a lot easier. My first conversation came from a gentleman named Mustafah. He took a tract, read it while waiting for his girlfriend in a shop and came back to me asking questions. He was very amiable and had a great interest in different world religions. I explianed the Biblical view of Creation and fall of Man into sin, Gods Law and how we break it, how Christ came to save those who repent and why the Biblical Worldview is the ONLY way to account for human experience of the world. 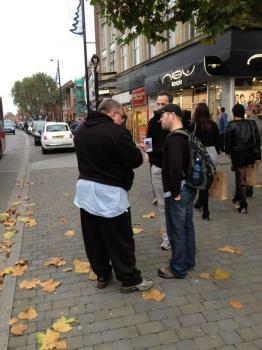 He appeared to take in every word and we eventually parted with him taking more tracts and an ear full of the Gospel. Towards the end of the conversation I had to become a little more direct and said to him plainly: “The Mormon Church is a false church.” He did not like this, so I tried earnestly to explain to him why this is the case. Mormonism is not Christianity, because it deviates most definitely from orthodox, historical Christianity. For that reason it is most certainly a cult, and one which must be exposed as such. Do pray for the man we spoke to, and the many Mormons trapped in this false religion. They “worship” Jesus, but it is not the Jesus of the Bible (the Truth) whom they are worshipping. Do pray for them! On Friday evening we had a good size time out once more, there were at least 15 of us. 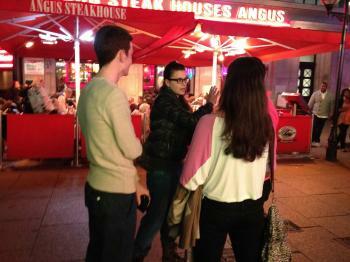 Not all were able to make it to the cafe but joined us a little later up at China Town. When we got to China Town I decided that as it was rather difficult last week we would head back to Leicester Square to see if things could be easier for us there. 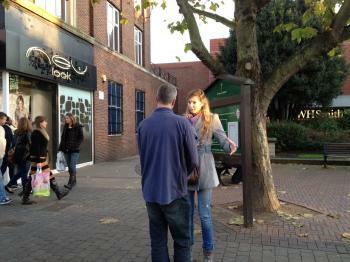 I was quite pleased that an area had opened up near the new M & M store so we set up to preach there. We didn't get a large crowd during the open-air preaching but some people did stop to listen as I shared the gospel. 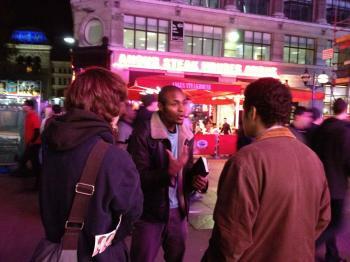 After I finished preaching we all got into conversation with people passing by, handing out a good number of tracts. Elyske shared afterwards about a conversation she'd had that was really God ordained. A gentleman passing by had taken a tract from her and after reading it came back a little later to talk to her about it. It truns out he has really been struggling of late and so was quite struck by the timining of Elyske handing him the gospel tract. She shared God's Word with him and was also able to share her testimony, which is always so valuable, as our testimony is personal and people can really relate to that! Please pray for him. It was a great encouragement to have had Brian join us on Friday. Brian serves in the U.S. Military and until just recently was in the U.K. on holiday. He had visited our church the week before, after a referral from Dr. James White over at Alpha & Omega Ministries. We had got talking and he mentioned that he did some witnessing back in the States and so I told him he must join us on Friday. He jumped at the opportunity. In fact, he made sure his schedule was laid out especially so that he would be able to join us. I think if he was living in London he'd join us every week! 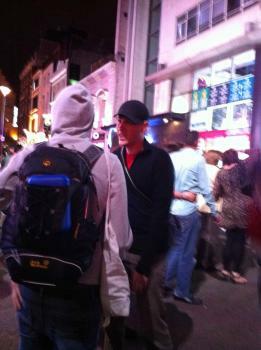 You can see Brian sharing the gospel with a young man in the picture to the left. Marie had a rather long conversation with a Muslim man that appeared to not really know a lot about Islam. She was able to share the gospel with him and although he grappled with the truth that Jesus is God, he was very responsive. 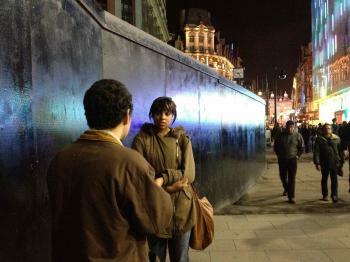 (You can see her sharing the gospel with the man in the picture to the right.) Marie mentioned that he appeared quite fragile and lonely. May the Lord draw him to Himself and comfort him with the peace that is found only in Jesus! 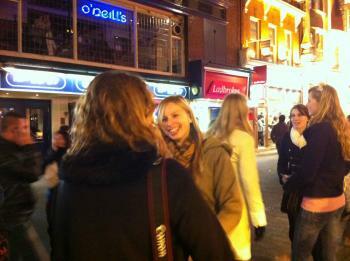 I had a great conversation with some tourists from Holland. They all gathered round as I shared the gospel with them. They were so open and responsive, it was quite amazing. When I took them through the law of God and spoke to them of sin it was so clear they understood perfectly that they had indeed transgressed God’s law. This made sharing the gospel with them such a joy. They all left with an in-depth gospel tract and much to think about. Do pray for them! I also had a conversation with two Muslim men. We spoke at length about the justice of God. The reason I brought this up with them was to show them that where the God of the Qu’ran fails, the God of the Bible succeeds! You see, if God shows mercy to a sinner, He is not just. If He acts justly towards the sinner, mercy is not given. How then do we reconcile justice and mercy? (Mercy, while definitely being one of God’s attributes, is not something He is obligated to pour out. This is why mercy means “not getting what we should deserve.”) I illustrated my point by saying that if “my sister” were to be murdered it would be right for the murderer to be sentenced and punished. To this they agreed. I asked them whether the judge would be a good judge if he overturned the guilty verdict and let the man go free. They agreed he would be a bad judge. I then asked them who’s standards are higher: God’s standards or human standards? They affirmed that God’s standards are higher. I then said to them that if a human judge is bound by the law and must execute justice, how much more must God! God must execute justice. If He doesn’t, He is not just, it as simple as that. Yet we understand that God is also merciful. So how is this demonstrated and how is justice and mercy reconciled? Here’s the good news: God pours out all His justice on Himself and in so doing saves us from His justice. We receive His mercy because all of His justice towards sin is taken upon His very own shoulders! The Son of God took our place so that we could go free. That is the gospel! They objected and tried to say that if God shows mercy to the sinner, without there being a sinless mediator standing in man’s place, God is still just. Yet this simply is not so. We all understand the idea of justice, and just because “God is God,” He still acts justly in the very way that we understand justice. Joining the rest of the team it was encouraging to hear about the conversations they’d had. Below are some more pictures from the evening. It was a blessed time! 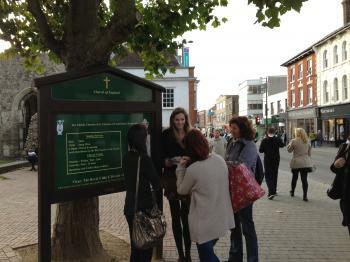 We had a number of people join us for outreach this past Friday, at least five new people, which was so encouraging. After a great time of fellowship in the cafe we headed out to our new spot near China Town. There was roughly twenty of us and so we were in for a great night! Qu. Can any mere creature pay for us? A. No. In the first place, God will not punish another creature for the sin which man has committed. Furthermore, no mere creature can sustain the burden of God's eternal wrath against sin and deliver others from it. Ezek. 18:4, 20; Heb. 2:14-18. Ps. 130:3; Nah. 1:6. Qu. What kind of mediator and deliverer must we seek? A. One who is a true and righteous man, and yet more powerful than all creatures; that is, one who is at the same time true God. I Cor. 15:21; Heb. 2:17. Is. 53:9; II Cor. 5:21; Heb. 7:26. Is. 7:14; 9:6; Jer. 23:6; John 1:1; Rom. 8:3, 4. Qu. Why must He be a true and righteous man? A. He must be a true man because the justice of God requires that the same human nature which has sinned should pay for sin. He must be a righteous man because one who himself is a sinner cannot pay for others. Rom: 5:12, 15; I Cor. 15:21; Heb. 2:14-16. Heb. 7:26, 27; I Pet. 3:18. Qu. Why must He at the same time be true God? A. He must be true God so that by the power of His divine nature He might bear in His human nature the burden of God's wrath, and might obtain for us and restore to us righteousness and life. Is. 9:5. Deut. 4:24; Nah. 1:6; Ps. 130:3. Is. 53:5, 11; John 3:16; II Cor. 5:21. Qu. But who is that Mediator who at the same time is true God and a true and righteous man? A. Our Lord Jesus Christ, whom God made our wisdom, our righteousness and sanctification and redemption (I Corinthians 1:30). Matt. 1:21-23; Luke 2:11; I Tim. 2:5; 3:16. Turning back to the objections from my heckler, it is important to note a few things. Firstly, the time between Jesus’ birth and the commencement of His ministry is documented in Scripture. See Luke 2:41-52. At the age of twelve He was aware of who He was and that it was necessary for Him to spend time in His “Father’s house” (the Temple). Secondly, the Bible is not obligated to give us a detailed account of his entire childhood and early adulthood. We know that as He grew up He “increased in wisdom and in stature and in favour with God and man” (Luke 2:52). Clearly He lived a life that was set apart from the rest of humanity. However it was not until He reached the age of thirty that He entered into His ministry in a far more significant way. There is no problem with this, for it makes sense that He would be of a mature age with adequate life experience when the time eventually came. The universe has always existed. The universe was created by a supreme being. I explained that option 1 is impossible, since for something to create itself it would mean that it existed before it existed. This of course is absurd. Option 2 has been accepted almost universally by the scientific community as false since the laws of thermodynamics show us that the universe must have had a beginning. This leaves option 3 as the only rationale explanation for our existence. She didn’t like this but it was obvious she saw the logic to what I was saying. I reasoned with her some more and explained that there truly is a God before whom we must one day stand and give an account. Although the spot we have chosen is great for open-air preaching, it is tricky with regard to one-to-one witnessing, as the road we are in is opened for traffic at roughly 10:00pm. 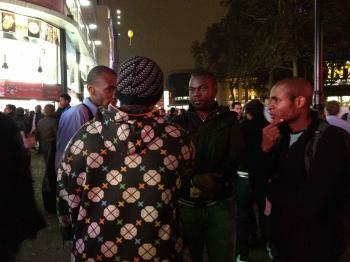 It became quite difficult and so we decided to move back down to Leicester Square. Arriving back at the Square we continued to witness to people and hand out tracts. It was a great time and I was so encouraged to join with so many brothers and sisters in making Christ’s name known. Lord may you open the hearts of the people to hear and respond to your Word. Grant repentance and faith Lord to the lost people of London! Praise the Lord in all things! 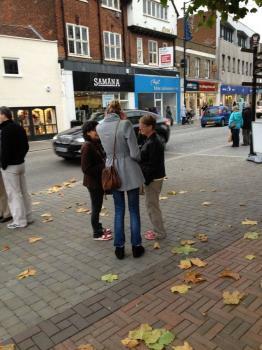 The Essex Team broke loose on the Brentwood High St today, sharing the Gospel to anyone and everyone who came our way. We began with a small team consisting of Rob Hughes and myself, and were soon joined by Roman, Elyske, Ingrid, Wesley and James. We spread out and handed out loads of tracts and got into a few conversations with pedestrians that would lend us an ear. I had a wonderful conversation with an ex roman catholic priest from India. His name was Thomas and he expressed "belief" in the Bible but when pressed, he only acknowledges the 'red letters' of Jesus. I asked if he was born again and he said he got born again at his "christening". We talked about Gods righteous requirements in his Law and how he matches up, and discussed Hell and justice. We parted amicably and I stressed 'faith in Christ alone' NOT in the roman church or a human priest! A great time of sharing was had by all. May God grant repentance to those who read or heard the Gospel this day! On Friday evening we had much to thank God for! The Lord truly blessed us with a wonderful time of outreach. Early that morning I received an email from a photography student (Hollly) who mentioned she was doing a project on street preachers and would like to come out and photograph the team in action. I was surprised by her request but saw no reason to say no and so replied saying that it would be no problem. By the time I reached the cafe later that evening I was encouraged to find Holly waiting for us. Shortly after the team began to arrive and before long we were a good 10 people plus. Holly had a few questions she wanted to ask, in particular what we do on the street and what we say to people. As it turns out Holly is not a Christian and so this was a wonderful opportunity to not only answer her question, but also share the gospel with her. I laid out the gospel as carefully as I could, not speaking to her directly as I might do when I normally witness to someone, but in such a way that she would have a firm grasp on what the gospel is. I was certainly praying for her as I did! I was so encouraged to see her taking notes, and although she was doing this for her project, I was in awe of how the Lord is able to use such diverse ways to bring people into a hearing of the gospel! As Leicester Square is under some serious new development in preparation for the 2012 Olympics, we have moved to a new location. 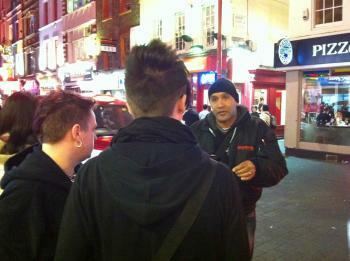 We are now very close to China Town, which is barely a ten minute walk from Leicester Square. It has proved to be a great location for witnessing and a wonderful spot for open-air preaching too! Although in the area of China Town, there are still plenty of English people about, and it is still typical London in that there are people from every nationality you can think of. As we were setting up I was thrilled to see that we had a really large team out. We must have been at least 20 people in size. Not all made it to the cafe, but instead joined us at our new spot. I stood up to preach and before long a good size crowd had formed. This was helped by a passionate heckler who really went out of his way to make his voice heard. I do like it when a heckler speaks up as he helps to bring in a crowd. Unfortunately the heckler we had on Friday night, while bringing in a crowd, was also a real handful as it was clear he was determined to be a hindrance to me and the preaching of the gospel. He did this in quite an annoying way by parading in front of me as I addressed the crowd. I have to admit this is something I find difficult to overcome and probably the biggest frustration I have experienced while preaching open-air. Some hecklers stand within the crowd and heckle, that is fine, but when they intentionally come forward and parade in front of you it is very difficult. It was not all bad though. At one point he turned to the crowd and said, “I bet no one here wants to hear this guy,” pointing to me. To my delight a number of people in the crowd responded by saying, “We do!” (Unbeknown to us a party of roughly 15 Christians, on holiday from Wales, were in London and just happened to be passing through as I was preaching. You’d almost think God was somehow involved!) This was great in that it helped to disarm him, although he did not withdraw entirely. Although he was a significant hindrance, I was able to speak past my heckler to the crowd and share the gospel. 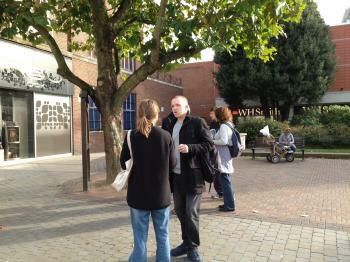 After I stepped down from preaching we all got involved in talking with people one-to-one. Holly was taking loads of snaps, we certainly kept her busy! I was so encouraged to see a number of the young girls on the team talking with her and quite a few shared their testimony with her as well, which was just brilliant. Do pray for her. The Lord certainly brought her to us and it really is so wonderful that she has been exposed to the gospel in such a clear way. In the picture below you can see Ymkje sharing the gospel with Holly. While we continued to speak with people I noticed that our angry heckler was still circling, even though I had finished preaching. I discovered later that his girlfriend is a Catholic and they often have rows over the existence of God. It was clear that he was venting and is angry with God. When God’s Word is preached there often comes hostility, and it is precisely because the gospel is the truth that there is this hostility. Please pray for him. Holly stayed for quite a while but left with much to think about, I’m sure! I told her we’d love to stay in touch and that she must let us see her project when it is finished! At the end of the evening we came together in prayer and thanked the Lord for all He had done. It sure was a full evening! Tonight the team had about fifteen Christians, this larger than usual number came from God sending an extra sister and some brothers in Christ to join in proclaiming the gospel of Jesus Christ on Queen Street. I was encouraged to see more Christians out witnessing tonight, because every extra person makes a difference to the entire team. The preaching line-up was Yarran, Lindsay, Josiah and Ryan. As usual, the authoritative message from God as revealed in the scriptures was proclaimed in the open-air, private conversations, and through the distribution of gospel tracts. One of the preachers explains: the great and glorious God who has made the world and everything in it, who gives us our very life and being, has not been obeyed by humanity. All have broken God's commandments, including those proclaiming this message, by things such as lying, stealing, getting drunk, having sexual desires for others outside of marriage, by failing to worship God perfectly. God is good and hates and punishes evil, and when left to ourselves, we will receive this punishment in hell for eternity. However, God sent Jesus Christ – fully God and fully man, He lived perfectly in God's eyes, never breaking His commandments. Then He laid down His life willingly through allowing himself to be executed through crucifixion. Jesus did this to take the punishment for the evil of His people, and then rose again to life, giving life to His people. God commands all people everywhere to turn from their evil towards trusting in Jesus Christ for salvation from evil and the wrath of God. 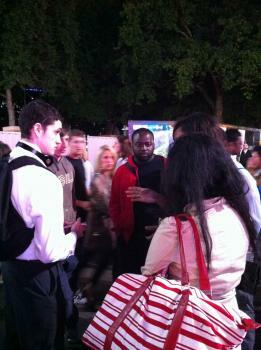 During the gospel proclamation in the open air, a young lady and young man interacted with the preacher. “Have you ever told a lie?”, the preacher says. The young lady hesitates and the preacher asks the young man with her, “Has she told a lie?”, with him responding promptly as witness to her guiltiness. The preacher is quick to explain, “I also have told a lie”, and proceeds to ask further questions. The young man interjects with opposition to God's standard of perfection. Nevertheless, the conversation hastily reveals that like the preacher, the young lady has disobeyed God. A sight that could shock many, that the voices of both the preacher and the young lady reveal that they deserve to spend their eternity in hell under God's punishment for breaking His commands. After her voice had responded, she was given a business-sized card that contained a summary of what her ears had already received. With haste the young man took the unknown card and threw it away, in a vain attempt to diminish the power of the message given by God Himself. Promptly, the preacher gave her another card that found rest in her pocket. How have you responded to the Lord Jesus? If you have turned from your evil and trusted in Jesus, please gather with the rest of your family in Him to share the message of God's full and complete salvation from sin and His wrath, if you live near Brisbane, please join us in serving our loving God on a Saturday night at 7:30pm in King George Square, Brisbane. If you have questions, please visit us outside Copenhagen/Myer Center on Queen St at 9pm. Never to disappoint, Saturday night again proved to be quite eventful! There were a few of us out tonight, which was good because it was football night and the fans were loud and proud. I was the first one up to preach and I decided to open with Romans 6:23 ”For the wages of sin is death, but the free gift of God is eternal life in Christ Jesus our Lord”. We live in a society that understands the concept of an owing wage, many people live for their weekly paycheck! Here we learn that the wage for our rebellious attitude towards God is death. Death is a punishment we deserve and is owed on the basis of our failure to worship and serve our Creator God. Earlier in the book of Romans we are told that “none is righteous, no, not one” and “all have sinned and fallen short of the glory of God”. Sin is universally participated in by humanity and therefore we are all deserving of death. Since we are all guilty of sinning against God, we all face this. But Romans 6:23 also points to a free gift of eternal life. How do you receive this? Through Jesus Christ. 2000 years ago Jesus came to earth for a purpose to “save his people from their sins” (Matt. 1:21) Jesus did this by living the perfect life we couldn’t live before laying his life down and dying on the Cross and rising from the dead 3 days later. He did this in order to take the hell- punishment for the sins of his people. God commands you to turn from your sin, repent and place your faith in Christ and his righteousness. Those who have done this show their heart has been changed and have been born again, assured of eternal life. It wasn’t long before some hecklers arrived. First up was a lady who claimed to be a pagan. She did not want to listen or engage in conversation. Instead, she just wanted to protest. Despite her abuse, the plus side was that her protests attracted an audience which enabled more people to hear the Gospel. However, her friend was a lot more aggressive and began screaming for me to stop preaching. Lindsay and Yarran stepped in front of me to try and calm the guy down, which worked for a time. However, he would walk off and then come back again and scream his abuse. After a couple of rounds he became increasingly violent, grabbing my shirt and trying to pull me off the box. At this point the Police had been called and he made no further attempts to attack me. As Lindsay stepped up to preach, he came back again. This time he was jumping in the garden behind Lindsay and looked like he might launch himself to knock Lindsay off the box. 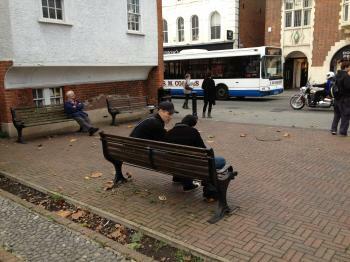 By this time, the Police had arrived and they were quick to remove the man from injuring himself or others around him. After giving testimonies to the Police, the man was removed and his lady friend also. This ended our initial opposition and the rest of the night went without a hitch. I was able to spend a good majority of what was left of the night doing some one-to-ones and handing out tracts with Aaron. I was able to talk the Gospel through with a Samoan group who said they occasionally go to church. It was a fruitful conversation and they all took tracts and were given free Bibles. I also had a conversation with a fellow who trusted in Science, even though he wasn’t sure what answers Science actually gave him. It was good that he was willing to listen as I explained that Jesus Christ is the only way of salvation…I think he took a tract as well. It certainly is a challenging time as each week presents new struggles. Lately, we have had a pretty consistent team of preachers and people handing out tracts. However, with a recent increase in violence we have had to be extra cautious in dealing with aggressive hecklers. Again, we are fortunate to freely proclaim the Gospel and speak the message of Salvation. Praise God for His works! Atheists. Aggressive hecklers. Police: A fairly typical Saturday night at Queen st. mall. Nonetheless, a great opportunity for the message of Salvation to be proclaimed. It was a full moon tonight. I was the first one to preach and it wasn’t long before a small group of our atheist friends arrived. Fortunately they weren’t as vocal this early in the evening and the Gospel was preached for a small time unhindered. One of them sarcastically made a comment, “What did Jesus actually on the Cross? Did he really do anything?” This was an excellent springboard for the Gospel so I was able to explain how humanity is under the just anger of God because of the evil we commit against him and therefore we are all deserving of punishment in hell. However, Jesus Christ lived a perfect life and was the perfect sacrifice when he lay his life down for the sins of his people, taking their punishment upon himself. Praise be to God who changes the hearts of sinful man, granting them to turn from their sin and trust in Jesus’ death and resurrection in order for them to stand blameless before God, on account of Christ, and receive eternal life! Unfortunately my voice gave way after a short time so I stepped down for Alex to preach. Alex was the second preacher up and had the pleasure of dealing with hecklers for the majority of the time. The typical questions/assertions were employed by the Atheists as the basis for their arguments against the Truth. “Other than the Bible what proof do you have that God exists?”, “Prove that Jesus rose from the dead….no you can’t use eyewitness testimony, that is invalid”, “Can God make a burrito so hot that he cannot eat it?”. There were, however, some good questions that were asked. One of them, was to the effect of, “If one man in his whole life only stole a loaf of bread and another was a mass murderer, would they both go to hell?” Again, this provided the opportunity to explain the Gospel and warn of the coming judgment. James 2:10-11 tells us that “whoever keeps the whole law but fails in one point has become accountable for all of it. For he who said “Do not commit adultery”, also said, “Do not murder”. If you do not commit adultery but do murder, you have become a transgressor of the Law”. Likewise, the man who is not a murderer but is a thief is accountable as a person who is guilty of disobeying the commands of a holy God who demands justice. So then, we are all equally deserving of hell. Our 3rd preacher for the evening was a new-comer to OP13, named John. Ryan spotted him preaching alone not far from where our usual spot is and invited him to join us. He eagerly jumped up on the box and preached for a small time, imploring people to repent and turn to Jesus. Next up was Ryan, who also had a good crowd of hecklers whose questions Ryan was able to answer. As is often the case, the later it gets the more people there seems to be and while this is a great opportunity for the Gospel, it also carries the danger of drunken people getting aggressive. Unfortunately Ryan was the target of such aggression. It seems that a person in the crowd was offering money for someone to punch/kick Ryan. One of them obliged and made an attempt to kick Ryan but did not make full contact. The police were called but the guys responsible had fled. Bek managed to capture them on camera and fortunately Ryan was uninjured. This sort of opposition has become increasingly regular over the last few months. Praise God no serious harm has befallen any of us but it is a demonstration of peoples hatred towards this message and towards God. By this time it was getting close to 12:00 so I finished up, preaching for 15 mins. We are blessed to be able to proclaim this great message of Salvation each week, uniting together in the hope we share. 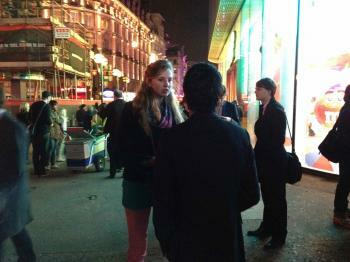 There were some good one-on-one conversations over the course of the night and many tracts handed out. Despite the occurrence of events, the Gospel was proclaimed faithfully and many people heard it although we have no power to convert people but it is God who draws his sheep and it is He who is glorified! How unfathomable that God would use sinful men to proclaim the message of Salvation to sinful men? Friday evening was a truly blessed time for the team. We met in the cafe at 7pm and enjoyed a time of fellowship and Bible study before heading out to the Square. During our Bible study we looked at Romans 12:9-21, which is such a tremendous passage. It details the marks of a true Christian and is summed up with this verse: “Do not be overcome by evil, but overcome evil with good.” When we are out on the street we come across much evil, but the goodness of God will always triumph over evil, and in that we can rejoice. Arriving in the square our team consisted of Andrew, James, Rhea, Roman and myself. After praying together I stood up to preach. You can see below a sort clip from my message. I emphasised our need to get right with God, that we are not an accident and have indeed been made by God, but tragically we have fallen in sin and so we stand condemned before a just and holy God. God, however, is also a God of love, and He offers forgiveness in Jesus Christ. He offers it to all and calls on everyone to repent of their sin and trust in His Son. Some did stop to listen and as a result a number of conversations began. I had some really encouraging conversations. One in particular was with a young man from France. He was a delight to talk to and really showed some interest in what I was saying. He mentioned that he had looked into Christianity but was not convinced concerning the reliability and authority of the Bible, particularly when we see so many other religions in this world. He also believes that the Bible has been changed and modified over the years. I explained to him that this is not true. We do have many translations of the Bible, but each of these translations have come from the same collection of manuscripts (the same source), namely, manuscripts written in Hebrew, Aramaic and Greek. We spoke at length about this but I realised that I would need to send him some information for him to look at, so I asked if I could email him later. He welcomed this, which was very encouraging. He also took some tracts before he left and so do pray that his heart would be open to the Gospel. I have since emailed him about the veracity of the Bible and I hope to hear back from soon. "On Friday I had a really long talk with one individual and both Rhea and Andrew came and joined in to talk to him. He was on a two day stay from Germany and claimed that he was a Christian but recently began to think that God does not exist and now at the age of 22 he was pretty set on thinking that there is not a God so he doesn't need to worry about judgement after he dies. So we emphasised that he should listen to his conscience and that deep down he knows that there really is a God. When we showed him that he has sinned against a holy God he disputed certain matters such as lying as not sining because it doesn't hurt anybody, but eventually he did see how it is sin to God as it breaks God's law and then we gave him the Gospel before answering the many questions he had. Before we left him he said he would certainly think about what we have said but he continually insisted that we could not convince him with which we continually answered of course we can’t, only God can. That was the main conversation i got into and I believe that Thomas went away thinking about the questions that had played on his mind earlier on." Everybody on the team was involved in a number of conversations throughout the evening, which was brilliant. At around 10:30pm we left the square and went and sat in Burger King, enjoying some hot food and giving feedback to one another from the time we’d had. We have been running with this format for a few weeks now and it’s really helpful for everyone. It’s great to share those encouraging conversations we’ve all had and to talk about the challenges we faced and the objections we struggled to answer. Friday night is definitely great training ground for all of us and it helps to equip and prepare us for those conversations we are fortunate to have later in the week. 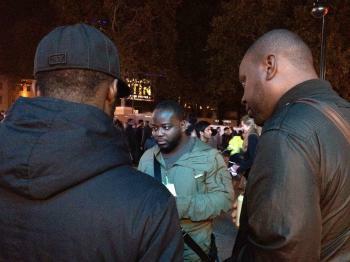 Do continue to pray for the work of Operation 513 London.